Terrarium TV is a popular, free media streaming site. It has everything a user might ask for, and in a jiffy, users have access to the best digital media content online. In a way, Terrarium TV helps a user from avoiding the heavy cable bills that show up at the end of the month, claiming for services that most are not even available. However, when it comes to Terrarium TV, users can stream digital media content, absolutely free of charge. With high definition quality and innumerable digital media (TV shows, Movies, Audio files, Video files, Documentaries, etc. ), the Terrarium TV software has made itself a people’s favourite choice when it comes to streaming online media. Most of the users prefer using Terrarium TV via their phones than the PC or Laptops. For, these days, phones are as useful and convenient to use as the latter. Now, many of us prefer downloading the media instead of streaming directly. Then, there are other users too, who wish to store the media somewhere in order to save their phone memory. Since, most of the users use the software application via their cell phones, which is why it is important to store the media downloaded from the Terrarium TV app to the SD Card. This helps save phone memory and maintains it usability without slowing the phone down. Thankfully, the Terrarium TV application has this feature where you can store media downloaded in your SD Card. Isn’t it great, being able to save your favourite digital media in your local storage? Do not worry if you don’t know how to do it, for we will provide you the detailed information on how to save your downloaded media files from Terrarium TV, in your local storage (SD Card). Open Terrarium TV app, you will get the latest version of the Terrarium TV apk. 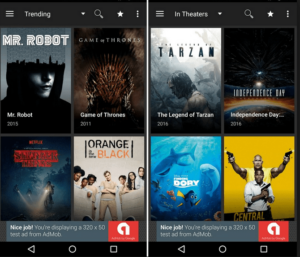 Once you have the updated version on your phone, open Terrarium TV and search for the movies of TV Shows that you wish to download for watching offline. When you find the media, you have been looking for, click on them to open, Select the file you wish to download (example: For Series, you will have to select the seasons and then the episode you wish to download). Click on the large sized ‘Play’ option at the bottom, right corner. After selecting the player, there will be links available for streaming. Choose the ones with ‘HD’ and you can check the size of the video. The only problem is Terrarium TV downloads and stores the media on the phone’s Internal Storage. Next, you will have to your SD Card, indirectly.As Android’s Default Download Manager does not allow it. Download and install ‘Download Manager’ from the application store. Open the Terrarium TV app and fetch the media you desire. Instead of selecting Download, select ‘Copy Stream Link’. Open Android Download Manager and tap on the ‘+’ icon on the bottom, right corner. Click on the ‘Start’ button to download the media. Once the download is complete, you will be notified on your Notification Centre. These were the simple ways of downloading digital media via Terrarium TV and storing it in your SD Card. This way, you can download and store as many digital media you wish you. It will take less than five minutes to get the initial procedure done. And then you are good to go.